Clearly, at The Olive Oil Source we take the crafting and care of olive oil very seriously. But that doesn’t mean we don’t enjoy a little levity. Someone recently enquired about Olive Oyl, Popeye’s tempestuous girlfriend. Although we grew up seeing those cartoons, we didn’t know much about Olive’s family history. Quickly proving himself, an editor sent him to New York where Segar debuted Thimble Theatre for the New York Journal in 1919. 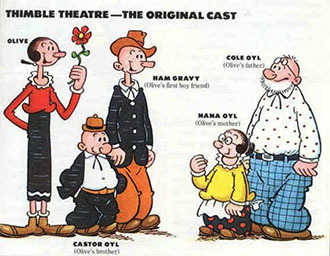 Lead character Olive Oyl was joined by her brother Castor Oyl, and her boyfriend Ham Gravy. Eventually, mother Nana Oyl (for banana oil) was introduced, as was daddy Cole Oyl. Spinach-eating Popeye appeared in 1929, and other Oyl family members such as Cylinda Oyl, Diesel Oyl, Violet Oyl, Otto Oyl, Sutra Oyl, and Standard Oyl appeared. We don’t know precisely what inspired the oil theme in the naming of his characters, but it’s hard not to conclude that burning the midnight oil (which was likely olive oil) in his lamp played a pivotal role!